The MTC's Operations Committee will be meeting on July 8th at 9:30AM and it's time for another monthly Clipper card update from the folks who makes the big spending decisions for the blue card. The MTC is working with Muni on the final transition of all youth pass users to switch from paper to Clipper cards. Starting August 1st, RTC cardholders (disabled cardholders) who has an authorized attendant, can request a specialized Clipper "attendant card" so the attendant can also be eligible for the appropriate discounts. To meet the needs of Caltrain passengers, MTC is working with Clipper and Caltrain to install add value machines at Caltrain stations at San Francisco, Palo Alto, and San Jose. The attendant cards will start August 1st, but will only be issued if the disabled cardholder requests for one. They don't want to go widespread and automatically issue attendant cards because the transit agencies are concerned if these cards are going to be fraudulently used (e.g. an attendant using the card when not accompanying the primary cardholder). 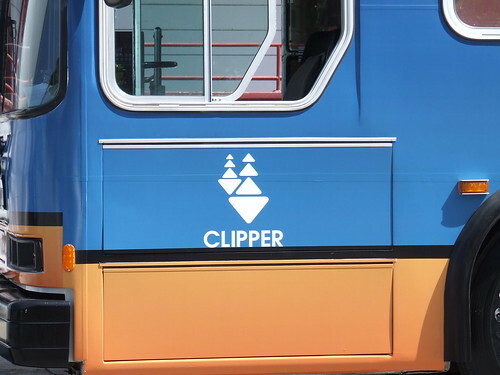 For the agencies participating in Clipper, they are required to meet goals to transition their fare media to Clipper, otherwise there could be sanctions issued by the MTC for failure. Many agencies were able to meet their scheduled deadlines, while some others were able to temporarily delay it, a few fare media hasn't met their goals, and some media can't do it because of certain circumstances. The most infamous of failure to comply is BART. They were supposed to transition all high value discount tickets by March 1, 2011, and the red and green tickets by May 1, 2011. MTC warned BART of the consequences for failure to comply and they have agreed to transition the three media types by the end of December 2011. AC Transit: Senior/Disabled 10-ride and monthly, Class Pass, and 1-ride tickets for social service agencies has been waived for now. BART: High value, green, and red tickets failed to transition and is proposed to do so by the end of this year. Orange tickets and BART Plus is on waivers. BART Plus can't transition because it utilizes non-Clipper transit agencies, such as County Connection. Caltrain: Go Pass was supposed to transition on January 31st; MTC is working with Caltrain on a new date. Muni: BART to Muni transfer at Daly City station was supposed to so by August 1, 2010, but is a complex problem for those who utilizes SF State shuttles away from BART and takes Muni back to BART. The classic Muni token was supposed to transition April 1st, but that's as rare as the dodo bird. Muni passports was supposed to transition on June 30th, but Muni only sells the paper scratch-off version. Muni transfers are supposed to be transitioning on September 30th, but that's being discussed, possibly due to other concerns regarding POP enforcement. I'm satisfied the MTC is finding a solution for the attendants who accompany disabled passengers to receive the same discount benefits while on duty. But I am concerned that with lack of enforcement, the cards can be abused by attendants whom are not accompanying their disabled passenger by giving the attendant discounted rides, to which they are not supposed to get. For the fare media transition, many agencies have been able to transition their media on-time or with a slight delay. I'm not impressed with BART's lax effort to stick to a schedule, and now they get another six months to slack off. One of the bigger controversies that will come out from the media transition is Muni transfers. City supervisors have considered to eliminate transfers as a cost cutting measure, but it leaves a gaping hole in the transit agency's enforcement policy, how will they enforce 'proof of payment?' By only giving transfers for Clipper users only, cash paying customers will get no receipt, thereby the enforcement of POP officers will switch from checking passengers at random stops to just enforcing the no entry through the back door rule. If enforcement is too lax, people will just board the bus illegally through the back door and if not immediately caught by the driver or POP officer, it's a free ride. If Muni wants to get serious to eliminate paper transfers, they'll need to do some serious enforcement on bus and metro lines to make people change their thinking. Read more about my thoughts about eliminating transfers at this older blog post. Muni could have a transition period where it issues receipts, possibly stamped with the route or bus number, as proof of payment. Holdouts would switch to Clipper knowing that was the only way to get a transfer, and you can still enforce POP. I don't know about the logistics and costs involved with route- or run-specific receipts, but I'm guessing it could be done. I generally like Clipper, but transitioning Muni transfers to Clipper-only is a really bad idea. It will only encourage fare evasion! BART PLUS can't transition because Clipper is not as functional. As to BART Green tix, why should I switch? they are more reliable than Clipper. Please read the blog over again, I clearly said that it can't transition because of non-Clipper agencies participating in the PLUS program. Eliminating paper transfers is a horrendous idea. Sure it would be nice to be more environmental and to trim costs slightly, but how much do we spend on transfers anyway? The number of transfers required will only go down as more riders switch to Clipper, naturally lowering costs. Cash fares are still rather common and it seems ridiculously unfair to penalize these customers by denying them a transfer. Many cash-paying customers are far away from the downtown core and cannot easily purchase or reload a Clipper card from a nearby machine. Muni's system relies on transferring to connect most portions of the city. For many riders, switching from one bus to another is not an added convenience, it is the only way to get where they are going. If the goal is to actually encourage people to take public transit, penalizing them for every little thing is a rather odd way of going about it. A cash trip downtown is now supposed to cost $4 if you ride a feeder bus line and transfer to the Muni Metro? I pay my fare and expect others to do the same, but robbing cash passengers in this way is simply greedy, and I can see many riders feeling perfectly justified in using their transfer privileges anyway by boarding through the back door if paper transfers are eliminated. Akit , It is precisely the non Clipper agencies which make BART Plus more functional. Frankly other than RFID v mag stripe/flash there was NO NEED to transition to Clipper. And it was a better deal for riders. As to reliability, while I have had my share of bad BART mag stripes/faregates, the number of people who have to tag 3 times to get a yes is staggering. I'm a teenage student that takes BART to school in San Francisco every day and I really don't know what I'd do if they discontinued the orange tickets. Bart is expensive enough for my family even with the discount I get, and without it? Bad news. It's really unclear to me whether you're saying in this post that the BARTPlus and orange tickets will be entirely phased out or if they'll just continue to function separate from Clipper. If they phase them out then Clipper's made things much less manageable for me and all of my fellow commuting students. Besides that, I miss the days when getting a ticket for underground Muni didn't take forever and when there were turnstiles that actually always worked and never made you look like an idiot as you exited a station. you just walked right through, none of this stopping and starting and awkwardly trying to step riiiiiiiggght in the path of the stupid motion detector. I miss my colorful paper monthly passes. Muni's never been perfect, but the idea of not issuing transfers completely defeats the whole system. I'm of course most familiar with people my age, and Clipper is often completely inconvenient for someone under 18 who doesnt have a parent paying for their public transportation. I can't even get into it right now, I find this whole thing too annoying. Clipper benefits a lot of people, I'm sure, but that's no reason to further inconvenience everyone else.